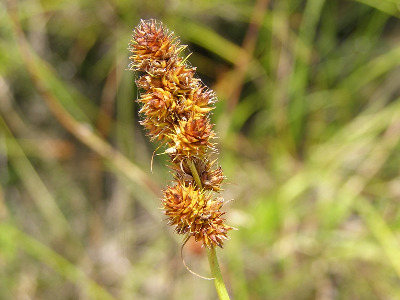 Moist to dry meadows and prairies, relatively uncommon. Often confused with C. vulpinoidea but the perigynia at maturity are a distinctive deep yellow to orange-brown and the inflorescences are dense, with the axis mostly not visible and bracts and pistillate scale awns are inconspicuous. Carex annectens matures distinctly earlier than the late season C. vulpinoidea. 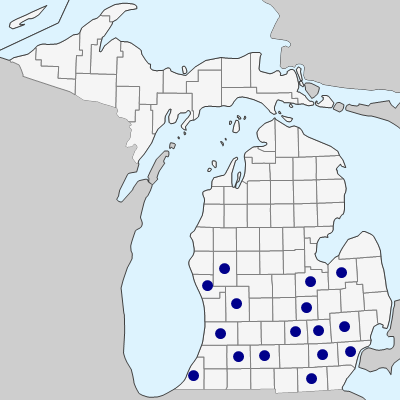 A number of records mapped as this species in Michigan Flora are unusual or late season specimens of C. vulpinoidea; see notes under that species. Our plants are all var. xanthocarpa (Kük.) Wiegand. MICHIGAN FLORA ONLINE. A. A. Reznicek, E. G. Voss, & B. S. Walters. February 2011. University of Michigan. Web. April 21, 2019. https://michiganflora.net/species.aspx?id=904.